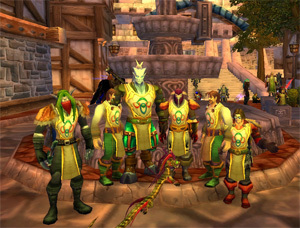 One of the most common reasons for WoW players to complete daily quests is to earn reputation with the various WoW factions. Reputation has a wide span, from hated and hostile all the way up to revered and exalted. Obviously you can’t buy from factions you are hated or hostile with. On the other hand, many WoW players don’t know that there are some vital bonuses that can be purchased from factions you are exalted with. Here’s a quick daily quest guide for the reputations most classes and races will find to be the most helpful. The Sons of Hodir is one faction you should really begin working on reputation with before you even reach level 85. You can get plenty of experience from the Sons of Hodir quests, especially the prerequisite ones you must complete so you can be friendly with the faction. Players who are not friendly with the Sons of Hodir are not eligible for the daily quests, so you will have to complete the prerequisite quests before you can begin building reputation with them. The Sons of Hodir daily quests are pretty average in difficulty. They involve killing a certain number of specific type of creature or collecting certain things from a specific area. Also don’t forget you can purchase reputation with the Sons of Hodir after you reach friendly status with them. You’ll gain reputation for every 10 Relics of Hodir you turn in to the Sons of Hodir Quartermaster. He will appear with a blue question mark above his head if you have enough to turn in for reputation. Also some players do sell the Relics of Hodir on the auction house, so it is possible to buy much of your way to exalted status if you have enough gold. Another part of the game that has some important daily quests for reputation is the Knights of the Ebon Blade area. Jewel crafters need to get to exalted so they can learn the desk for the Glowing Twilight Opal. All melee DPS classes will want to at least get to revered status with the Knights of the Ebon Blade because they will then be eligible to purchase the Arcanum of Torment, which is one of the best head enchants for melee DPS in the game. Don’t forget that you can turbo-charge your reputation by purchasing and wearing the Knights of the Ebon Blade tabard when you reach friendly status. Wearing the tabard inside instances earns you reputation with the faction. Tanks will definitely want to work on their reputation with the Argent Crusade. This is because of the Arcanum of the Stalwart Protector, which is a great enchantment for a head slot item. Tailors also should raise their reputation with the Argent Crusade so they can learn the pattern for Brilliant Spellthread, which is a very common leg enchantment for healers and casters.